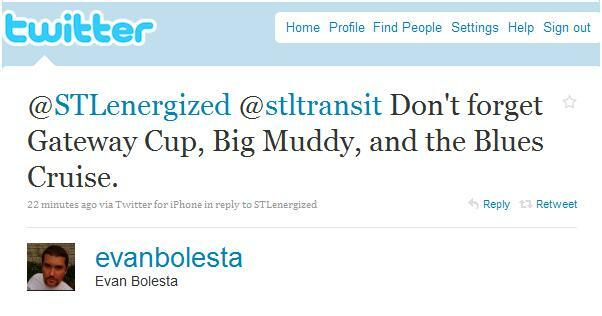 OK – so it’s Labor Day weekend in St. Louis. The weather forecast suggests sunny with a healthy side of beautiful. For weeks and weeks it’s been stick-to-your-seat hot or wash-away stormy, and here is a great opportunity for everyone to get out and enjoy the end of summer. It’s OK if you don’t want to brave the holiday traffic and gas prices. This weekend is a great time to stay home and have a ‘staycation’ in St. Louis. Monday, September 6, Labor Day, all MetroBus and MetroLink will run on a Sunday schedule! This evening, the Gateway Arch Riverboats are hosting an Arch Rivalry Riverboat Happy Hour Race, Illini fans vs. Mizzou fans, down by the riverfront. Admission gets you a one-hour cruise on the riverboats as well as one free drink and snack bar, with cash bar to follow. The Riverboats are accessible via the Arch-Laclede’s Landing MetroLink Station. Tomorrow is the Arch Rivalry Football Game with Mizzou v. Illini at 11:30 a.m. at the Edward Jones Dome at the Convention Center MetroLink Station. Easy to say that the inside of MetroLink trains will be all shades of black and gold, orange and blue tomorrow. 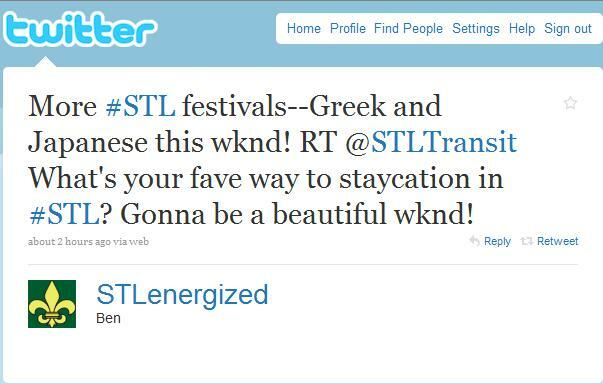 STLEnergized brought forth the time-honored tradition of St. Louis festival-going, and the first weekend in September is full of great options. The Greek Festival at St. Nicholas Greek Orthodox Church at Forest Park Avenue and Kingshighway is a foodie favorite. The festival is two blocks from the Central West End MetroLink Station or via the #95 Kingshighway. The Missouri Botantical Gardens (MOBOT) is hosting the Japanese Festival, a weekend packed with events from cooking demos to Aikido to tea ceremonies. MOBOT is accessible on Saturday via the #14 Botanical Gardens from Central West End, or the #8 Bates-Morganford and #80 Park Shaw from the Civic Center Station. EvanBolesta suggested some of the events around town to catch an exciting bike race or hear great live music. The Gateway Cup is a top bicycle racing event through four St. Louis neighborhoods with events and spectating opportunities throughout the city: Lafayette Square, St. Louis Hills, The Hill, and Benton Park. Many bus lines weave into those neighborhoods. Check out the routes near you and come watch the races! St. Louis is a blues town, and this weekend is host to two major blues festivals: the end of Bluesweek and Big Muddy Blues Festival. Big Muddy takes the stage on the historic Laclede’s Station with three stages singing the blues all day Saturday and Sunday with easy access to the Arch-Laclede’s Landing MetroLink station, or a short walk from the #99 Downtown Trolley stop at 4th and Washington. And Lisa_S_47 reminds us that the weather is the perfect time to get out and simply enjoy the amazing places around St. Louis that are easy to take for granted, like Forest Park. 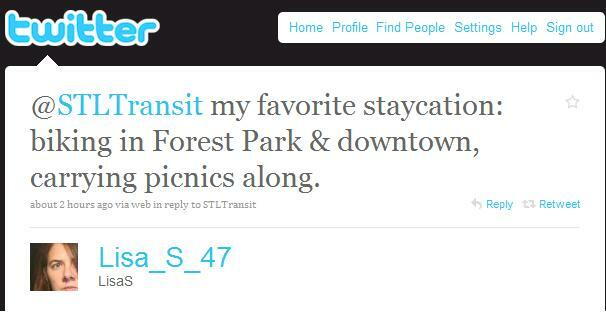 Take your bike, a picnic lunch, and good company and visit all of the places that make us proud to be from St. Louis. This weekend is the last for the #3 Forest Park Shuttle. $2 all day for adults, and a rack for two bikes to ride for free. All routes and schedule information are available at www.metrostlouis.org. Wherever you go this weekend, however you go, safe travels for everyone!